On the odd occasion when we have a quite weekend. I like to use this precious time and do something fun with the kids. Last night we had ‘Movie Night’. It’s very simple but the kids love it. 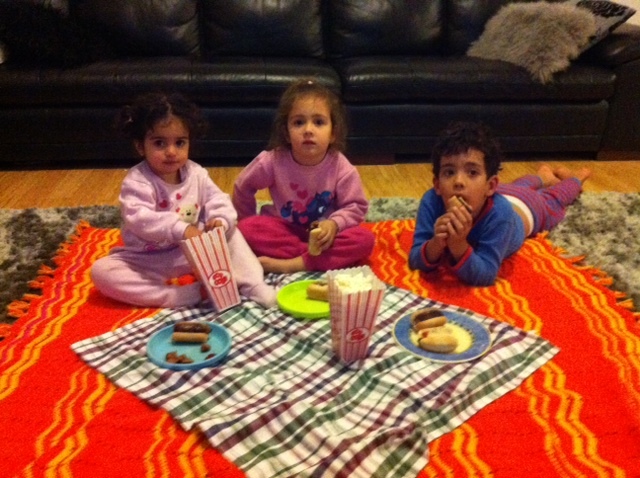 The kids get to have a picnic dinner while watching a family movie. I usually cook something easy like a sausage in a bun or toasties. As a treat the kids get freshly made popcorn and a couple of lollies. Davide or I choose the movie, as there would be a big argument between all three of them – Oscar would want to watch Star Wars, Layla would want Barbies and Molly would be yelling ‘maker maker maker’ (Mr Maker). This allows us to choose golden oldies from our childhood. Movie night starts early so they’re in bed at their normal sleep time. Its great way to spend a Saturday night with kids!